By Mina Gera (Head of Adult English Language Publishing) and Jenny Lovel (Digital Publisher, ELT) from Macmillan Education publishers. – There are now officially more mobile devices than people in the world. – By the year 2017 there will be three connected devices for every person on the planet. – The end user has high expectations for digital products, but wants stuff for free. – Piracy makes it difficult for authors and publishers to protect their work. Nonetheless, there is currently massive growth in online learning. Macmillan, for example, will continue to publish printed books, but digital publishing has already become core to their business and the key to that is blended learning. The student should move seamlessly between the printed coursebook and their Digital Learning Environment – a comprehensive and well supported array of flexible, tailored, interactive digital materials. The workflow may look different and some of the processes are new, but the material itself must still be pedagogically solid, well thought out and well edited. The core skills of writers and editors are as important as they have ever been. The question: How do freelancers move with the times? They need to be flexible and willing to work with new digital platforms, authoring tools and mark-up languages. ‘It’s a learning curve, and we are all on it,’ says Mina. However, it might not be clear where the top of that curve is or where everyone else is on it. Questions about the difference between html and xml and whether a Learning Management System is the same as a Content Management System can cause a head-spinning list of taxonomies and semantic tagging but lynda.com – an online training library – is a great resource for learning more about head-spinning topics. Templates are now the norm for working on Digital Projects. The problem is that sometimes editors become so focused on getting the template correctly completed that pedagogy can take a back seat. Editors should take note: content changes after the initial content stage can be expensive, problematic and a real headache for developers. If a freelancer can recognise whether a learning activity works or not, be it in print or digital format, then that freelancer is already indispensable to the publisher. The question: What can we expect our role to be in this new workflow? Once all of the assets have been gathered and ordered into the template, everything is handed to the tech developer. The developer now flows all of the data into the Content Management System and produces an ‘Alpha release’ – a functioning version of the product with some, but probably not all, of the content and assets in place. At this stage there are likely to be various issues with the way content is displayed or how it functions and a very thorough check is required. Giving feedback to the developer on what needs to be corrected in this now multi-dimensional product, from a missing comma to a change in template interactivity, must be done in a very clear and systematic way. Sometimes bugs and issues are logged in a relatively simple Excel spreadsheet, but increasingly more sophisticated logging tools are being used. Popular ones are Wrike, Jira and Redmine. During the next phase the developer responds to the feedback and a ‘Beta release’ is produced. Another round or two of checking and product releases follow before the product reaches its final form. Accuracy and clarity is crucial when feeding back. Developers are not usually conversant with editorial speak, and may even be based far overseas and speak another native tongue. We can’t expect this massively diverse group working with different programming languages to all learn one editorial markup system. The situation Freelancing is essentially running your own business and that side of things can be complex and daunting to someone used to taking home a simple salary. We discussed the key differences, pros and cons of being a sole trader and a limited company, whether we should be VAT registered and what expenses can be written off against tax. Becoming a limited company is easier than most people think and could save a significant amount of money for some. The tipping point where it starts to be worth it appears to be around the £25k turnover mark. We are legally obliged to be VAT registered if our turnover is more than £81k (!! ), but we can voluntarily register for VAT with any turnover size. 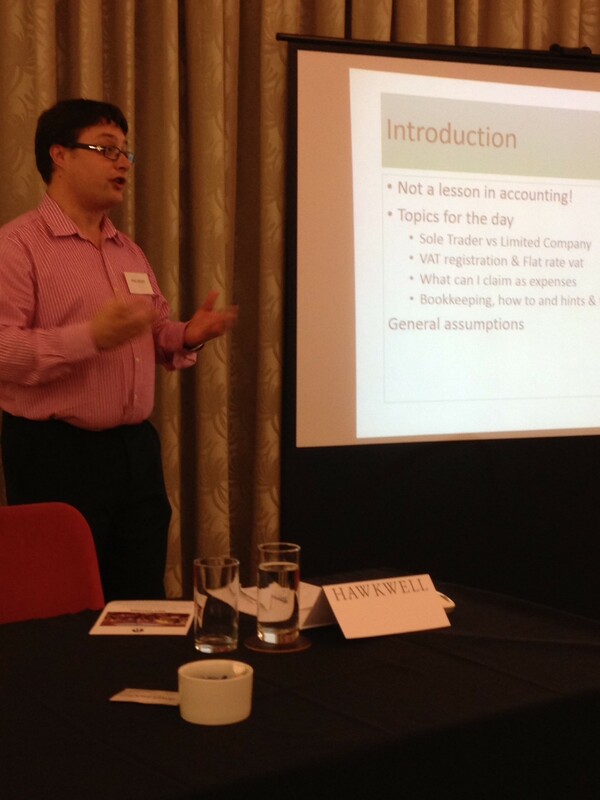 The Flat Rate VAT Scheme is a great option for sole traders in the publishing field. It is very easy to set up and administer and effectively means that you receive a bit more money for every amount you invoice. The questions Do we need to invest in Adobe Pro? No, we don’t. That’s a relief – it costs over £400. You can do pretty much everything you need to do as an editor using the free Adobe Reader XI software. The only thing you can’t do is split a PDF into smaller sections. Instead, use a PDF splitter such as smallpdf.com. Is there an agreed standard mark-up protocol? No. Not even within individual publishers. Is it better to use imported ‘traditional markup’ stamps, or the annotation tools within Adobe Reader? Either can be used (unless the client specifies), but choose one method, ensure that your marks are clear and concise, and be consistent. ask the client to send a printed version at of at least one of the stages. cover text with comment boxes or notes (it may look as though they’re in the margin, but will sit over the text and obscure it if the pages are printed out). leave comments on the page that aren’t addressed to the designer. From our vantage points behind our desks, miles away from our end users, many of us in the ELT freelance community may feel we are being dragged reluctantly into processes which are very different, that fragment the content and have greater associated time pressures. But let’s think about that end user for a moment. After all, the end user is driving this. So what would you want? Wouldn’t you want language learning to be fun, slick, dynamic, versatile and responsive? Tailored to you? We are part of the process that is making that happen. Now that’s a truly exciting place to be. And when you can be in that place with all these other people in the room, who are happy to provide a support network, it feels like a very successful day. To read more, look for the #FreeELT hashtag on Twitter or read this Storify of the day. So, will we run another away-day? Given that our (digital) feedback survey tells us that 100% of respondents would come to another, the answer has to be a resounding ‘yes’. 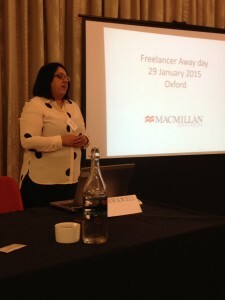 Helen Holwill has been a freelance ELT writer, editor and project manager for eight years. She started her career by teaching English in Spain before working as an in-house editor first for Macmillan Education and then for Oxford University Press. Sign up here for news of the next Freelancers’ Away-Day or to sign up to the ELT Freelancers’ database. Thanks very much for this Helen, brought back great memories of the day and particularly liked your reflections at the end! Very informative and useful! I’m so glad you found it useful, Nicola. It was great that you could come along and thanks for your input on the day. Great post, Helen. Thanks very much for summarizing. It’s very helpful for those of us who live on other continents and find it challenging to buzz over for the day. Hi Joe. Thank you for taking the time to comment. Karen and I are very aware that distance is a big issue for many freelancers, so it is great to hear that you have found this useful and of interest. We are currently planning the next event and are aiming to be creative about how we can get people involved and pass on the resulting information. Any ideas gratefully received!